We are seated, now, in the home of strangers. It's a big family, Abdul (this man we've only just met outside) and his kinfolk. We're wedged in atop a horseshoe of couches between his mother and his father and his several sisters, along with whom I understand is perhaps his uncle and niece. A few other friends and relatives pass through the home to greet us over the course of the evening. I should mention that this family does not speak English, and thus these details arrive in bits and pieces, in hints and conjecture. Lauren is busy astounding our hosts with her command of Arabic—which, yes, is not fluent, but is good enough for everyone to work through conversation rather than just sit around in silence. This family is incredible. Hospitable would be an understatement. All we wanted was a little tajine (that we were willing to pay for) and maybe as an afterthought some land to camp on, and instead we have found ourselves, suddenly and unexpectedly, as the guests of honor for this serendipitous evening. Dinner comes slowly and delectably. First tea, of course. Copious quantities of tea throughout. Chinese gunpowder with fresh mint and heaps of sugar. Halima, Abdul's younger sister, assures our glasses never go empty. Then starters: a bowl of olives fresh from the groves behind the house, warm bread freshly baked, a plate of olive oil freshly pressed from the family's olive stores. Oranges, sliced and served, also just brought in from the yard. Dates, large and sweet. As conversation continues between Lauren and our hosts, the table in front of us crowds with our second, third, and fourth courses. Beans and couscous and soft, stewed vegetables. Later, a sweet rice pudding. More bread, more tea. Everything is delicious. We are beyond satiated, full to the point of discomfort, and after several hours—and our emphatic promises that we really have had enough to eat—dinner draws to a close. Everyone leans back against the couches for a rest. On the television across the room, Al Jazeera plays softly. Donald Trump has just announced his plans to move an embassy from Tel Aviv to Jerusalem, and the Muslim world is visibly upset. Leaving Rabat a week earlier, we'd pedaled right by a massive peaceful demonstration against the relocation. The television broadcasts footage of protests just like that one stewing up all across the Maghreb, the Middle East, and beyond. As a clip plays of a sullen Trump waddling across the screen, I do my best to disappear into the soft plush of the couch cushion behind me. But American as we may be, no one here seems to mind. Eventually we head to bed. In the morning we're treated to another surprise meal, almost as hefty in portion and long in duration as the last. We eat, we drink tea, and once we're packed, we're led into the fields behind the family's house for a walk through their land. Thousands of oranges bud off hundred of trees. Their orchards stretch into the foothills behind us, little bright orbs of citrus punctuating the foreground. Halima, who has taken a liking to Lauren (they milked a cow together earlier this morning), picks several oranges fresh from the nearest tree and places them in Lauren's hands. Her arms quickly fill with fruit. This heap of oranges is a parting gift for us. Also a parting gift: several loaves of bread, warm from the oven, and a bottle of olive oil, produced quite literally in-house. This, and an invitation to come back and visit whenever. Next time, maybe for a week. Touched, thankful, sad to leave, we hug the family goodbye, push our bikes back to the main road, and wave as we pedal off. We mark this spot, the small village of Douar Sidi Mohamed Chelh, on our map. For if—for when—we'll return. A few more days and a few more mountains separate us from the city of Chefchaouen. We ride. We stop to eat. We pass a pair of French cyclists heading in the opposite direction (they're coming all the way from France) and we compare notes. We carry on. We get permission to camp in a gas station garage. We sleep, and in the morning we pedal some more. 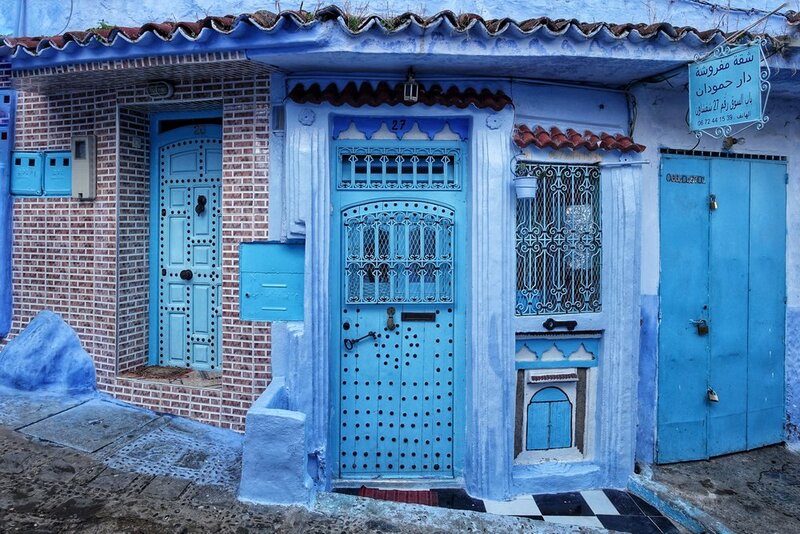 Chefchaouen is called the Blue Pearl of Morocco. It's a touristy spot, popular on all the northern Morocco itineraries, and a world apart from the quaint villages we've been passing through these last few days in the mountains. But, it's a popular place for good reason. Chefchaouen is beautiful. It is, like Jodhpur in India, a city bathed in blue. Walls, steps, doors, floors. Everything cerulean. Periwinkle. Azure. This, atop an already charming layout of narrow, meandering alleyways adorned with plants and carpets and cats basking in the sun. It's a city on a hill, a city on the side of a hill, a city more or less sliding down the steep gradient of the Rif foothills but boxed in at its lower end by a long, encircling series of walls and gates. It has little room to grow. And so it is small and so it is dense. We don't find it very beautiful upon arrival. We've just huffed and sweated up a sharp incline to get here, and we're tired and cold and hungry. These streets are narrow, and they're thronged with locals and tourists alike, and as I said, they're steep. Very steep. Pushing two loaded bicycles into the medina, panniers jutting off the back, is difficult work. It's made all the more difficult by the man who's been following us for the past fifty meters. He first approached us outside the bab—the gate—and asked if we were looking for a place to stay. That is, in fact, exactly what we're looking for. But he, like every other tout in Morocco and the world over, works on commission. If we accept his offer and let him guide us to a guesthouse, he will receive a cut of whatever we pay. And that cut will be added, in an unspoken but widely understood sort of way, to our bill. A ten percent finder's fee, maybe. So it's always cheaper to decline. We tend to have no trouble finding inexpensive lodging on our own. We thank the man but carry on through the gate. And now he is following us. He is telling us he knows of a very good place. Great location. I tell him that we are inside a small medina. Everything is a great location. I reiterate that we are just fine on our own. But my no falls on deaf ears. "Cheap, very cheap. You won't find a better price." "Okay, no hotel. Hashish?" he whispers. "You want some hashish?" No, I do not want any hashish. Leave me alone and stop touching my bicycle. "Very good hashish. Best hashish. Good price." I stop. I turn around toward Lauren, who is five meters back trying to fight her way through the crowd. In a loud voice I shout back, "Hey Lauren! This guy has some hashish he is trying to sell us. Do you want any of his hashish? He says it's some very good hashish." Selling hashish is illegal in Morocco. Now, I have no problem with hashish being sold. I think criminalizing a non-addictive substance that grows from the dirt is a very silly thing. But I also think that people should respect the word no. I don't want to get this guy in trouble. I just want him to leave us alone. Talking very loudly about his hashish proposal in the middle of a busy street has the desired effect. He runs away. We do, shortly thereafter, find a place. It's cheap. It's lovely, or as lovely as a room for under ten bucks can be (which is actually still quite nice). We eat and go for a stroll around the town. It's late afternoon. The sun's rays catch the dust in the air and we are enveloped in a golden haze. The light dances against the warped blue plaster of the nearest wall. There's an amber halo around the mountains to the east, and the alley ahead is empty and quiet. For a moment, everything feels magical. Glossy and timeless. For a moment only. In Chefchaouen these moments do not last. Someone is always lurking, ready to spring upon you with the latest sale. Hello, how are you? Here, buy this. There really is no way to handle these interactions well. It's a damned-if-you-do, damned-if-you-don't kind of thing. These guys—they know what they're doing. Lauren and I are walking in the medina. A man stops us with his hand outstretched. I shake it. "Hello! Don't worry, I don't want to sell you anything. Just tell me: where are you from? Ah, America! I love America. What part of America? Oh, how nice. What are your names? Such lovely names. Is this your first time in Morocco? No, it's not? Wonderful. Alhamdulillah. Yes, yes, thank you. It is a beautiful place. You may have noticed our rugs, yes? Such beautiful rugs. Speaking of which, would you like to buy a rug? I can give you a very good price. Please, please, just follow me to my shop. Just to look." If you stop you are a sucker and if you do not stop you are rude. Damned if you do, damned if you don't. But damn, these doors are pretty. We stay in Chefchaouen a few days. We meet some other tourists, which is rare for us but also quite nice. From China, from Switzerland, from America and Estonia. We share dinners and walks around the souk. I'm feeling a bit under the weather—have been since Fes—so I'm not great company. But still, it's nice. We continue on. 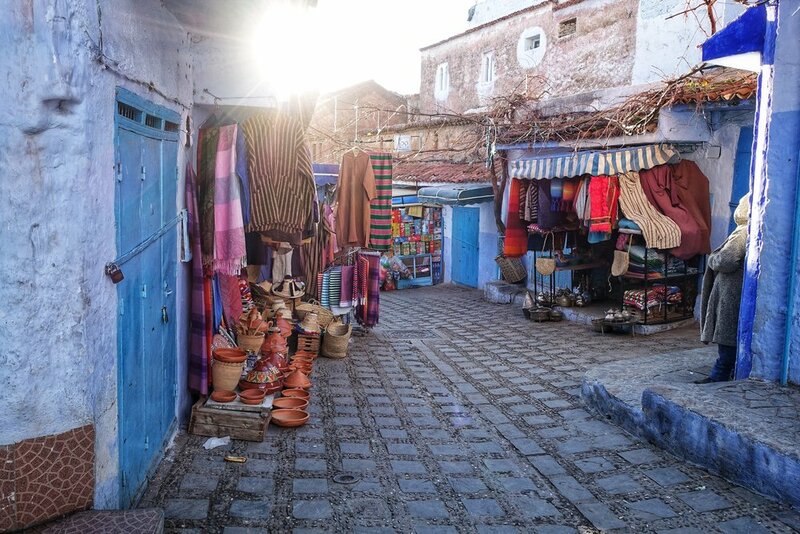 We leave the Blue Pearl and cycle through the Rif, a mountainous region in northern Morocco that's home to about half the world's hashish production. This explains its abundant supply back in Chefchaouen. It's illegal to grow it, though tolerated by the authorities in a baksheesh-y sort of way, so it's not exactly the most comfortable place to pedal through. At every stop, young men with fixed frowns glare at our bicycles, sentinels for the growers just around the ridge. Keep moving, their eyes say. Nothing to see here. We pass an Argentinian bike traveler. Going the other way, of course. They always are. We say hello. We reach our last pass and we fly down the other side. The Mediterranean sparkles in the distance. We spend a night in Tetouan. 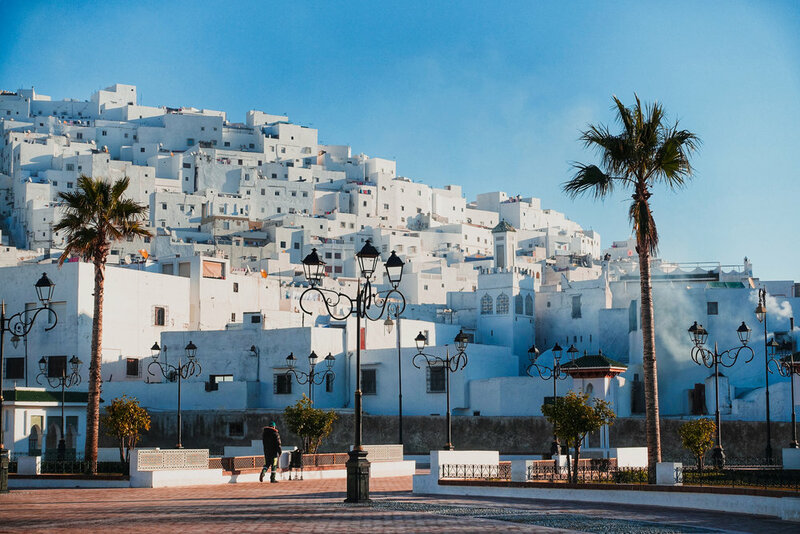 If Chefchaouen is the town of blue and Fes the city of red, then Tetouan is decidedly the medina of white. It feels a little like Santorini, we agree, though neither of us has actually been. Palm trees, sun for the first time in days: it is, if nothing else, emphatically Mediterranean. In the morning, after buying four pounds of dates each, we leave Morocco. 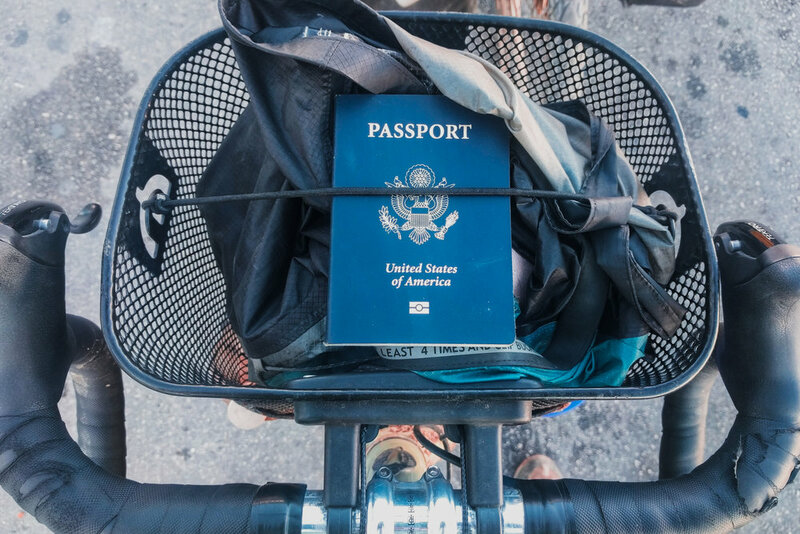 We get on our bicycles and pedal to the sea and ride our final thirty or forty kilometers to the border. We stop at emigration and get our exit stamps and walk our bikes to the other side of the fence. We enter Spain. No, I'm not forgetting the boat ride. That'll come later. We're in Spain, but we're also still in Africa. We're in a strange, in-between little world called Ceuta. Ceuta is one of two Spanish exclaves on the African continent. It is part of Spain and has been for about five hundred years. The Moroccan government isn't terribly pleased about this arrangement. They insist that Ceuta, and its sister exclave Melilla, are colonial vestiges that rightfully belong to the kingdom of Morocco. The Spanish government retorts that Ceuta and Melilla have been part of Spain since before the kingdom of Morocco was even the kingdom of Morocco. The King of Morocco vehemently disagrees with Spain's version of his kingdom's origin stories. In protest, the border crossing to Spain is not sign-posted from the Moroccan side, so if you're not looking for it you'd be sure to miss it. Anyway. We are on the edge of two continents. We are still in Africa, our home for the last six months. But ahead is Europe: legally just a few meters north from where we stand, and physically just a few more kilometers by ferry. Ahead is Spain, France, Italy. A very different place than the one we've come to know and love. A very different adventure. It's chaotic here, in this no-mans'-land between emigration and immigration. Busy with the hordes of travelers coming from Spain, and those like us leaving Morocco. A little too hectic to appreciate these last few steps properly, to reflect. So, hurriedly, we push on. We'll process later. Ceuta is a madhouse. While the road from Morocco is fairly clear, the Morocco-bound lane is backed up by thousands of cars. Bumper-to-bumper, stretching for kilometers. Ceuta is tiny, just a few square kilometers, and so this traffic jam at the border stretches all the way into town. These drivers have likely been here for hours. They seem impatient. When an inch of space opens between their front bumper and the car ahead, they immediately close the gap. They blare their horns. Not because it'll make the border guards move faster. Just because. Somehow Lauren and I have ended up on the wrong side of this traffic jam. We're on the sidewalk, west of the southbound traffic. We want to get to the northbound lane east of the southbound traffic. We wait for a small gap to appear between two vehicles in the southbound lane. Lauren scoots through and turns left. I look at the driver in the southbound lane, signal that I'm just cutting through to turn left as well, and scoot in between his SUV and the car ahead. I'm almost clear of the lane when he begins to run me over. Slowly, very slowly. His front bumper makes contact with my pannier. He inches forward, trapping my bike between his SUV and the bumper of the car in front of him. I'm pushed sideways. I begin hitting the hood of his truck to get his attention. Um, hello, you are running me over. I turn my head to make eye contact. To my surprise, he is looking right at me. Not with malice, nor anger. With indifference. Blankness. I am occupying space where he wants his vehicle to be. So, um, hello, I am running you over. His foot presses down on the accelerator, and my bicycle is pulled underneath his truck.